The public relations landscape has changed dramatically from what it was in 1989, when the original Public Relations Theory volume was published. Reflecting the substantial shifts in the intervening years, Public Relations Theory II, while related to the first volume, is more a new work than a revision. Editors Carl H. Botan and Vincent Hazleton have brought together key theorists and scholars in public relations to articulate the current state of public relations theory, chronicling the ongoing evolution of public relations as a field of study. The contributors to this volume represent the key figures in the discipline, and their chapters articulate the significant advances in public relations theory and research. Working from the position that public relations is a theoretically grounded and research based discipline with the potential to bring numerous areas of applied communication together, Botan and Hazleton have developed this volume to open up the public relations field to a broad variety of theories. Organized into two major sections--Foundations, and Tools for Tomorrow--the volume presents four types of chapters: discussions addressing how public relations should be understood and practiced; examinations of theories from other areas applied to public relations; explorations of theories about a specific area of public relations practice; and considerations of public relations theories and research that have not been given sufficient attention in the past or that hold particular promise for the future of public relations. It serves as a thorough overview of the current state of theory in public relations scholarship. Like its predecessor, Public Relations Theory II will be influential in the future development of public relations theory. Taken as a whole, the chapters in this book will help readers develop their own sense of direction for public relations theory. 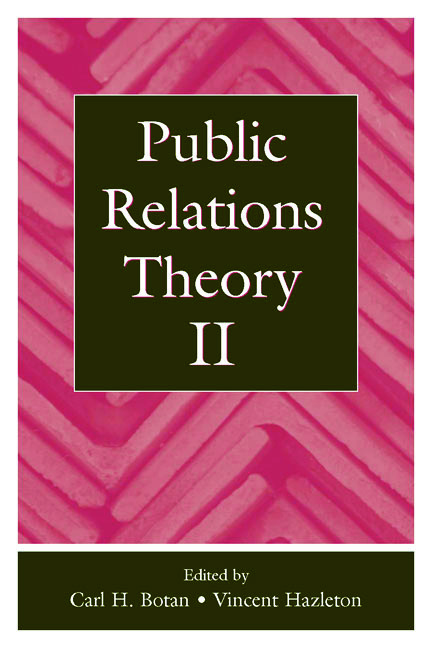 Public Relations Theory II is an essential addition to the library of every public relations scholar, and is appropriate for use in advanced public relations theory coursework as well as for study and reference.